One thing that’s almost always said about indoor electric grills is the lack of precision cooking. A lot don’t even have that on/off button or a temperature control valve. This makes it very easy for you to overcook your food which naturally no one likes. 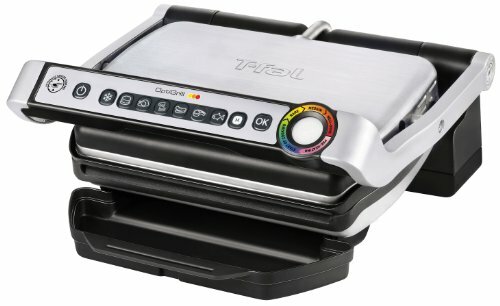 So when T-Fal came out with an indoor electric grill purported to have a Precision Grilling feature, it definitely caused some raised eyebrows. Can you really cook delicious food on an electric grill? Turns out you apparently can. Now, before we get into the meat of things, let’s get the specs out first. The T-Fal GC02 Optigrill is a stainless steel indoor electric grill that comes with a 1800-watt heating element; removable, die-cast aluminum plates with non-stick coating; and a removable drip tray. It has 600 square centimeters of cooking space that can fit four to five pieces of meat. It weighs 6 kilos. It also has a special handle where all the controls are located along with the LED cooking-level indicator light that will change colors as it goes through the different stages of the cooking process (from preheating to well done). Now, there are four features that make this baby really stand out – the automatic sensor cooking, the automatic thickness measurement, the 6 cooking programs, and the 2 cooking modes. So, what do these special features do? Let’s start with the cooking modes. 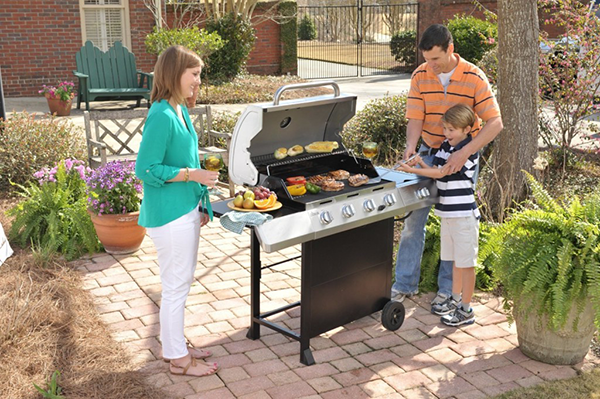 The grill allows you to cook in two modes – one is for frozen food while the manual mode is for thawed food. The 6 cooking programs, on the other hand, will allow you to let the grill know the type of food you are cooking (burgers, poultry, sandwiches, sausage, red meat, and fish) and it will automatically adapt its cooking time. Then there’s the automatic sensor that detects how many pieces you’ve slapped on the grill and in what stage they are in the cooking process – rare to well done). Lastly, but never the least, the automatic thickness measurement feature which enables the grill to “sense” how thick the meat is and adjust the temperature to cook it all the way through. Now, we’ve already said that the grill does work wonders. These really great features do work as promised except for the frozen cooking mode which can be a bit hit-and-miss. The grill does a lot of the cooking for you and we mean that literally. You don’t have to hover over it, lifting the top to see how things are going inside the grill. You can leave it be, do other stuff in the kitchen (like drink a glass of wine or two), and wait for the beep to let you know if it’s time to get the food out. Even the most inexperienced cooks will probably have an easy time using this appliance and getting great results. And the clean up isn’t anything to scoff at either. You get removable, dishwasher-safe plates and drip tray. Can’t get easier than that. Are we saying that this is the perfect indoor electric grill? Well, it does come close. But there are a couple of things that could get improved on. First, it’s a really bulky appliance and quite heavy to boot. You need to have room for it on your countertop and let it stay there. We’ve already mentioned that cooking frozen food doesn’t always turn out well but then it won’t even if you’re using a Weber. Another thing that might be an issue is the LED light. It’s great that it changes color to let you know at what stage the cooking process is at. But it can be bit difficult to interpret the colors sometimes. You definitely need to make sure that the cooking instructions are always nearby to help you out. But is it worth it? Well, if you’ve got enough cash to make that investment, go for it. It’s not everyday you find an appliance that will cook food beautifully without any help from you.